Over the last 18 months, the battery capacity has reduced itself to 44% of the original value (This happens with LiIon cells as they age). My last full capacity ACPI reading is now 21060 mWh, and provides 1-2 hours of working time on my IBM X31 Thinkpad. In a few more months it will be time to replace the Li-Ion cells again. Luckly, a friend gave me an IBM T60 extended battery (containing 8 cells) that had failed. When I took it appart, it appeared that 6 of the cells worked fine, and two of the cells were dead (killing the entire battery). TaDa! 6 free replacement cells! This entry was posted in Bluetooth, Phones, Projects, Technology by Jay. Bookmark the permalink. I have an e-machine m6805 laptop. The original battery does not hold much of a charge anymore so I replaced it with a new battery. The new battery has the same specs as the original. It charged up fine (Up to 100% over a couple of days) and works great as long as the computer is plugged into the power adapter (power converter to the wall). When I unplug the power adapter, the computer turns off immediately with the new battery. When I put the old battery back in it works with the power converter and will work when unplugged as well, but for only 15 minutes or so — old battery. What is going on? Is it possible for the new battery to work off the power converter and charge but not run on battery alone? The old battery can. Whats your thoughts. Am I missing something simple? It appears that your new battery is defective. Return it for a replacement. The new battery is not able to provide sufficient current to run the laptop, probably due to a faulty cell. Hi! Thanks for this article. I’ve a question- Can I use 9 cells in a 6 cell battery? Will the circuit be able to charge it? Can the 6 cell battery accommodate 9 cells? 9 cell battery is available for my laptop so it means the size of the battery is same. You probably have a 10.8v battery. 10.8v is made up of 3 cells at 3.6v each. Because you have six cells, they are paired up (3 sets of 2 cells in parallel, or possibly 2 sets of 3 cells in series) to still give 10.8v. If it is in the first configuration, you could probably add 1 more cell to each parallel set (giving 3 sets of 3 cells in parallel). If it is in the 2nd configuration, you should really expand it to a 12 cell battery, so that both of the two sets (of 3) would have double the number of cells. (so that you’d have two sets of 6…if you had one set of 3 and one set of 6, the set of 3 would die before the set of 6, resulting in no gains, and probably hurting the smaller set. Thanks for your reply, Jay. Yes, I’ve a 10.8V (47Wh) battery & I guess they must be paired up as 3 sets of 2 pairs of cells. Another thing I wanted to know- is Compaq using chips which erase themselves when the battery is opened up? I read about the self erasing chip only in the comments of your blog but couldn’t find more information about it. Is it really true? Thanks a lot for replying & helping me out! The particular battery I re-filled was a generic X31 battery, not an official IBM/Lenovo battery, so I did not run into this problem. I do not know what particular manufactures are doing, and the only way to know for sure is to try and see what the result is. I used two plastic tools usually sold for cell phone disassembly. Basically, they are like straight blade screwdrivers, but made out of plastic so they are less likely to crack/scrape plastic. For my X31 battery, it was held together with snaps, and I had to pry the battery apart at the seam. Even with the special tools I left a few marks, but it’s not bad. I have X60 8-cells battery, barely used, only 19 cycle counts, but only capable storing 25Wh from designed capacity 74Wh. How to tell if some cells in battery pack are faulty? Is isafe to fully charge it before I open the case and test each one with volt meter to identify faulty ones? 1) If it’s that new, it should be under warranty. Before opening it and voiding any warranty, check to see if you can get it replaced. Most reputable battery manufactures guarantee that the battery will not drop below half of it’s rated charge within one year. 2) If you are unable to get warranty service, then yes, you can check each individual cells voltage reading. You probably want to separate each individual cell from the battery pack. Charge each cell at a very low current (20mA) to prevent overheating, burning, exploding, etc at 4v until it stops drawing current (voltage stabilizes) [A current and voltage controlled power supply would be good for this.] Then test each cell after a day or two and see if any have dropped voltage significantly. If you have cells that are not completely dead, you may need to test them under load. I suggest getting a small electric motor and running it off of each cell for 10-20 minutes then testing the voltage again. Cells who have dropped more than the norm are your weak cells. [Again, you must be sure that the small motor or light doesn’t draw enough current to overheat the cell, causing it to burn or explode. If you don’t have an easy way to measure current, just keep your hand on the cell and if it starts to get hot stop drawing current and find a smaller load. I picked up on your original blog about replacing my own X31 and T41 batteries. What I’ve been doing is using new batteries purchased from ebay. My last transplant was done using the batteries from a PA3399U-1BRS Toshiba battery pack. The pc board is a different between the IBM and Toshiba, so a wiring mod was done to the IBM board. Basically, adding two wires in place of the existing long metal tab links. Sorry, I can’t explain it very well since I don’t know what to call these metal extrusions that go from the cells to the board. In any case, the Toshiba battery costs me $14.80 shipping included. You might try going this route using ebay as your battery source. Toshibas will work as well as other brands as long as they are Li-ions. Just thought I would pass this along to you so you don’t waste money on batteries from 3rd party vendors… you never know what you’re actually getting. By using batteries meant for a other laptops, at least you know it’ll be top name batteries. Forgot to mention… I only buy NEW “original OEM” manufactured battery packs from ebay. Sometimes you have to wait for a deal, but it’s worth it. Also, Thanks for the blog… it helped me! I have a fault Sony battery pack, and have bought a replacement. Upon using this replacement i discovered Sony has hardware blocked the use of non-Sony batteries. I now plan on transplanting the cells accross into the Sony battery block, but i need to make sure it is infact the Cells in the Sony battery that are broken. How did you manage to test your friends cells to test whether they were broken or not? I charged the cells using a current and voltage regulated power supply (50 mA at 3.8 volts) until they stopped drawing current. Then I measured their voltage a few days latter. The bad cells had dropped in voltage much more than the good cells (3.0 volts vs 3.7 to 3.8 volts). Also, the bad cells would fail very quickly under a 100mA load (small DC motor). If your original battery used to work, and then gradually faded (or even faded relatively quickly) it is a good bet that it’s the cells that caused the problem. If it was working fine and then just suddenly stopped, it could still be a (very quickly) failing cell or a problem with the electronics in the battery. Probably the easiest way to test is to just swap out the cells as you planned and see if they work. It’s a 12V battery, so I suspect it has 10 1.2V cells, since these are the most common. Now, I want to replace the cells. I noticed these are cells you can pick up at any store under the name of rechargeable AA batteries. Would these work? Btw, do you have any tips on opining it? Because I can’t get any movement in it, and I’m a bit afraid to break it since the laptop won’t power up without the battery, even with the power adapter. Kenny, Most of the rechargable AA’s on the market are indeed NiMH cells. 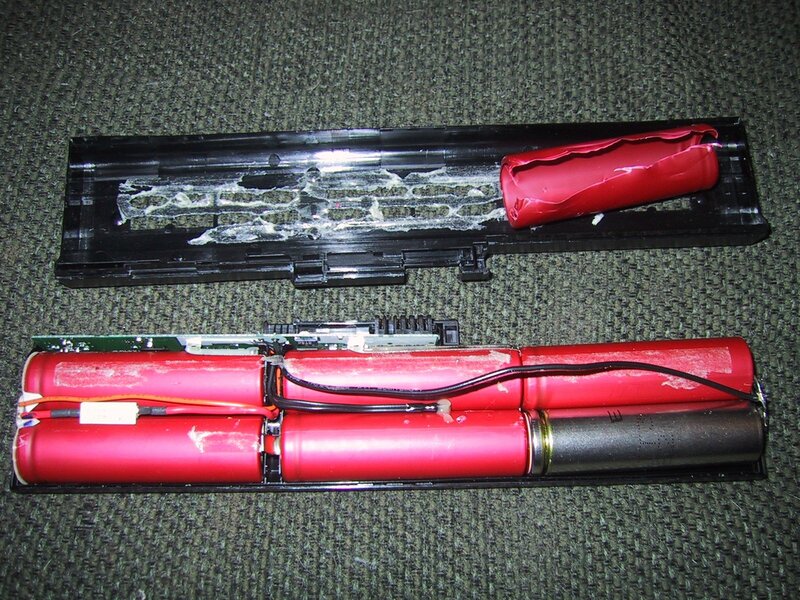 They are probably a bit smaller physically than the cells used in laptop batteries, but if you can make 10 or 20 of them fit it could work ok.
For opening the case….sometimes you just have to put a screwdriver in the crack and force it open. It will leave a mark. Question about a Dell battery. Hi Jay, i’ve been toying with the idea of swapping my Li-ON cells in my Latitude D620 rather than buy another battery from Dell for $140 and just have it die after a year and start the cycle all over again. But before I do I was wondering if I could get some advice.. First of all, where do I purchase Li-ON cells, second it seems the secondary battery you can buy for this unit with takes place of the optical drive is made of Li-Po instead of Li-ON and customers say it lasts longer, my question is can I swap my Li-ON cells for Li-Po cell and why didnt they just use them in the first place. Thank you in advance. I bought my Li-Ion cells at Batteryspace.com. They also sell li-po cells (which are easier to fit into small square/flat packages). People use li-pro mostly for the ability to mold/form them into non cylindrical shapes, but they are a slightly different battery chemistry as well. You should be able to substitute Li-Ion for Li-Po cells or visa versa as long as you are able to get them to fit in the enclosure. I wanted to replace my IBM X31 battery but I don’t exactly know where’s the seam that you’ve mentioned. Do you have a picture to show? Thanks! Pingback: Jay’s Technical Talk › Refilling laptop batteries! I have got a compaq 6604au notebook and its about 18 months old and since two weeks my battery started acting quite weird. My battery meter indicates that the battery is charging but still stuck at 39%. Whatever i try it won’t go above that.But sometimes it suddenly goes to 100% for a few seconds and again drops to 39% in less than a 30secs even if its on AC power. I have even tried calibrating the battery but that didn’t work either. I found this site by (you guessed it), having troubles rebuilding a laptop battery. Thanks to anyone in advance who might be able to shed some light on my problem. I worked in Telecommunications for 27 years.. I repair computers for a sideline…I am semi-retired. Computer is a Compaq Presario R3000. Using the old battery,the laptop charge light came on and went out ever so quickly on power-up. With the battery removed, (or in), the laptop works very well on AC. I made a simple diagram to aid in the rebuilding. This is a battery comprised of 4 sets in series of 3 CR18650’s in parallel…(3.7 volts) x 4 = 14.8 volts. I was constructing a 2800×3 = 8400MAH battery…WOOOO, the reserve!!! I replaced all of the cells with 12 (filled in the blank spaces) 2800 MAH CR18650 cells bought from E=Bay. The wiring was simple enough…space was a bit of a problem, but I got it all nicely in the case. I temporarily taped the case together….to try it in the laptop…and VOILA!!! When I plug the battery in to the computer, it does recognize that a battery is there; it just isn’t charging. With the battery OUT of the laptop, there is NOT 14.8 volts (or a resonable amount) on any of the pins. There IS 14.8 volts going in on the B+ pin on the protection circuit board. SO…I read my face off…and lo and behold, discover that the small PCB in the battery case is not merely a voltage regulator, or charge controller, or anything else I had imagined it to be. Since my battery is outputting zero, I now have to assume that either the protection circuit board is duff, or that the EEPROM needs to be reset back to the original values. I do NOT know the pinout of the HSTNN-UB02 Battery…it would help if I did, because then I’d know what the pins on the battery are as well. I have the datasheet for the M61047FP Battery Protection circuit. I could include it here, if anyone can help determine how to reset this thing from what was essentially, a power-down mode. The datasheet simply says that once a charger is detected by the circuit, a reset is sent to the microprocessor to get things back to “normal”. I also see that there are a few software programs out there that will “reset the EEPROM”, but the one I looked at was a mere $179……. Any ideas? Any help would be appreciated….largely!!! Step 1: Charge them up to full voltage (3.6v) using a trickle charger that limits the current to 20mA or so. (Using a current regulated power supply allows you to safely charge the cells, without a power control circuit, and also without causing them to blow up! IMHO, 20mA is low enough that excess power will be radiated as heat once the cells are fully charged. (This can take several days…) If you have a device designed for charging individual LiIon cells safely, you can use that instead. Step 2: Use a multi-meter to measure their charged voltage (If it rapidly drops from 3.6v, they are bad). hello i have readed some coments. but i did not find what can hep me. i have a laptop battey of hp nw9440, i removed the cells and repleced with a new ones. after mounting the baterry in a computer , it was not recharged, only descharged. i would lie to recive some hints about how to solve this. It sounds like you do need to re-set the BMS circuit board to get your battery to charge. 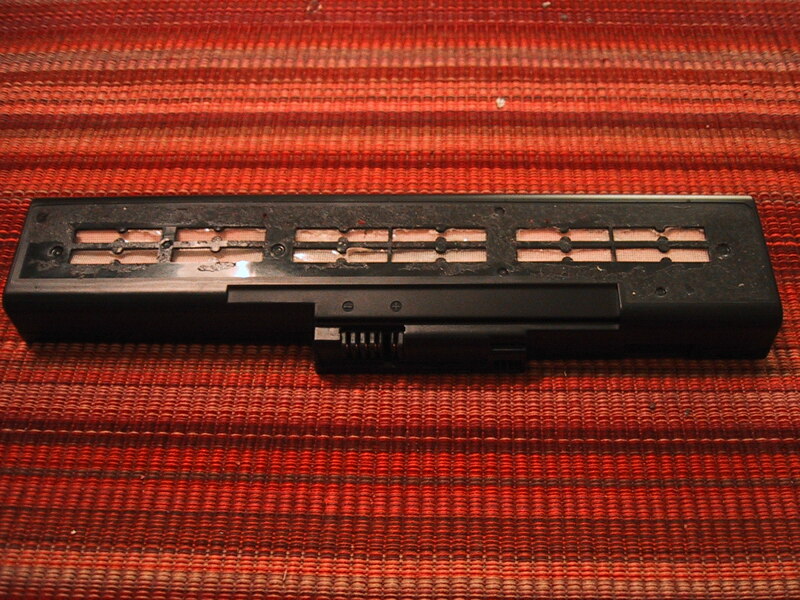 However, I’m afraid I do not know how to do this for the HP NW9440 battery. I ended up ordering a 4-cell battery from lenovo for my Thinkpad T400. The battery was manufactured 5 months ago, is that acceptable? 4 months isn’t too bad from a shelf-life perspective. Keep in mind that most reputable battery merchants (such as Lenovo) will sell you a battery that is slightly better than it’s rated or specifications, just to insure that you get a 100% of the capability they quoted you when selling it. Thanks Jay, I guess that is good to know. Too maximize my battery life when the laptop is 90% plugged in, set the maximum charging to 80%. Is there anything else that can be done. Yes, keeping the battery between 80% and 20% depth of discharge (don’t over charge, don’t over discharge) is the best thing to do if you don’t need 100% of the battery capacity. The Power Management software on the Thinkpad has the ability to charge the battery when it reaches only a certain %. Should I for example charge the battery only when it reaches 10% remaining or charge it to 80% automatically when it is plugged in. To maximize lifetime, you ideally want to keep the battery as close to 80% charged as possible, but you probably don’t want to have it cycling on and off super frequently, so I’d say start the charge at 70%. You never want to go below 20% (deeply discharging the battery shortens the lifetime). And charging above 80% also slightly shortens the lifetime of the battery. If you know you are going to be away from power for a long time, it’s fine to charge it up to 100% to get maximum power, but it will (slightly) reduce the total battery lifetime. But realistically, if your laptop is plugged in 99% of the time anyways, you will probably run into the “shelf-life” aging of the battery before you run into the “number of charge/discharge cycles” aging of the battery.